Manor Farm is like any other English farm, expect for a drunken owner, Mr Jones, incompetent workers and oppressed animals. Fed up with the ignorance of their human masters, the animals rise up in rebellion and take over the farm. Led by intellectually superior pigs like Snowball and Napoleon, the animals how to take charge of their destiny and remove the inequities of their lives. But as time passes, the realize that things aren't happening quite as expected. Animal Farmis, one level, a simple story about barnyard animals. On a much deeper level, it is a savage political satire on corrupted ideals, misdirected revolutions and class conflict-themes as valid today as they were sixty years ago. Eric Arthur Blair, more widely known as George Orwell, was a British writer. 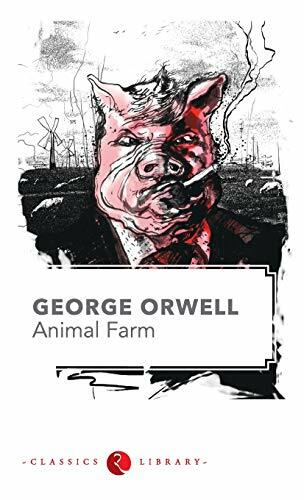 Other books by George Orwell are 1984 Nineteen Eighty Four, Burmese Days, A Clergyman's Daughter, and Coming Up for Air. He wrote fiction and non-fiction. His writing expressed his distaste for despotism and totalitarian regimes, as well as his support for democratic socialism. George Orwell was born in 1903 in India. A year later, his mother Ida Blair moved back to England with her children. Orwell initially studied at a Catholic Convent, but later moved to a boarding school, Cyprian s School. He went to Eton on a scholarship, but did not complete his studies. He joined the Imperial Police and was posted in Burma. He later returned to Europe, and lived in Paris and London, before finally settling down in England. His book, Down and Out in Paris and London, was published under the pen name of George Orwell. In 1945 came Animal Farm, which made him world famous, and his reputation as a great writer was sealed with the publication of Nineteen Eighty Four in 1949, shortly before his death.